"Scrumptious pizza is easy to prepare at home when you use Sister Schubert's Parker House Style Rolls." Preheat oven to 375 degrees F. Line a baking sheet with parchment paper and coat with non-stick vegetable oil spray. Carefully remove Sister Schubert Parker House Rolls from pan and place on prepared pan. Using a rolling pin, compress the rolls into a 9- inch round. In a small bowl, combine olive oil and herb blend and brush top of crust. Spread pizza sauce over top of crust. Top with remaining ingredients. Bake 18 to 20 minutes. Loosen pizza with a large spatula if necessary. Cool slightly and slice into desired pieces. Serve. 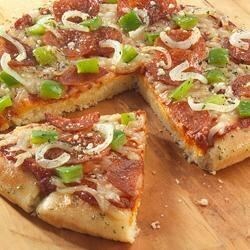 Homemade pizza in less than 30 minutes? This video shows you how.